Introduction: Patients with chronic respiratory conditions suffer from alterations in the mechanics of breathing and mucociliary clearance with symptoms of dyspnoea, cough and reduced exercise capacity. Pulmonary rehabilitation aims to improve these symptoms and subsequently reduce the associated morbidity and improve quality of life. 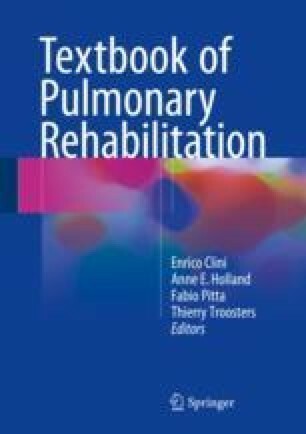 Methods: Techniques for breathing exercises and mucus clearance techniques are described and the rationale and evidence for their inclusion in pulmonary rehabilitation is explored. Results: The most common breathing exercises included in pulmonary rehabilitation are diaphragmatic breathing and pursed lips breathing. While there is evidence for benefit in some individuals in terms of breathing pattern, not all patients respond to breathing exercises, with some experiencing a worsening in symptoms and work of breathing. The application of mucus clearance techniques requires individual assessment for indication, efficacy and preference for technique. Conclusion: There is no evidence to support the routine inclusion of breathing exercises or mucus clearance techniques in a pulmonary rehabilitation programme. These techniques should be trialled on an individual basis with appropriate evaluation for benefit. Roberts SE, Schreuder FM, Watson T, Stern M. Do COPD patients taught pursed lips breathing (PLB) for dyspnoea management continue to use the technique long-term? A mixed methodological study. Physiotherapy. 2016; doi:10.1016/j.physio.2016.05.006. Rodriguez Hortal MC, Nygren-Bonnier M, Hjelte L. Non-invasive ventilation as airway clearance technique in cystic fibrosis. Physiotherapy. 2016; doi:10.1002/pri.1667.